Marriotts flagship timeshare resort in Palm Beach. This is an OCEANSIDE view. 2 Bed, 2 Bath with lock-out feature. Annual floating use, gold season (weeks 22-34). TWO weeks!! 2 bed, 2 bath unit, Ocean Side view, Annual Floating Use, Gold Season. Seller has 2 identical weeks and will sell both together for $8,000 or best offer. Gold Season, Annual Floating Use. 2 Bed, 2 Bath, Ocean View Villa. Annual Floating Use, Platinum Season. Two Bedroom, Two Bath with Lockout Feature. Seller owns two weeks, buy both and save! Two Bedroom, Two Bath with Lockout Feature. Annual Floating Use, Platinum Season. Seller owns two weeks, buy both and save! This Ocean View unit is priced to sell! 2 Bedroom, 2 Bath Ocean View Unit. Platinum Season. Annual Use. Available for use in 2020. Marriotts flagship timeshare resort in Palm Beach. This is an OCEANFRONT view. The location is as good as it gets! Marriott's Ocean Pointe timeshares may be as close to paradise as any vacation you and your family could take. Located in the breathtaking Palm Beach Shores of Florida, the resort is perfectly situated to create priceless memories of relaxation and delight. When staying at Marriott’s Ocean Pointe timeshare resales, you will find yourself surrounded by ideal year-round temperatures and unbelievable scenery. Enjoy postcard-quality views of sandy beaches and crystal-blue waters from the comfort of your own Marriott’s Ocean Pointe timeshare. The only thing more comforting than the sound of the ocean and the cool breeze blowing through the palm trees is the amount of money you saved buying a Marriott’s Ocean Pointe timeshare resale. As an owner of Marriott’s Ocean Pointe, you can enjoy the ambience of the ocean with the shopping and dining of Palm Beach in a worry-free, unforgettable vacation. Marriott’s Ocean Pointe timeshare resales offer a variety of amenities to suit the more active lifestyle if relaxation is not your primary focus. Enjoy the volleyball and tennis courts provided for a competitive afternoon, or simply a friendly match. Thanks to your proximity to the ocean, Marriott’s Ocean Pointe is the perfect destination for anyone who loves water sports. Ocean Side Beach Service can help owners try exciting activities like wave running and parasailing during your stay. Marriott’s Ocean Pointe fractional ownerhips also includes a state-of-the-art fitness center for all of your exercise needs. If you ever tire of swimming in the ocean, Ocean Pointe has an incredible four heated pools at your disposal. If it’s a sedentary aquatic experience you seek, look no further than one of the relaxing whirlpools at your fingertips. 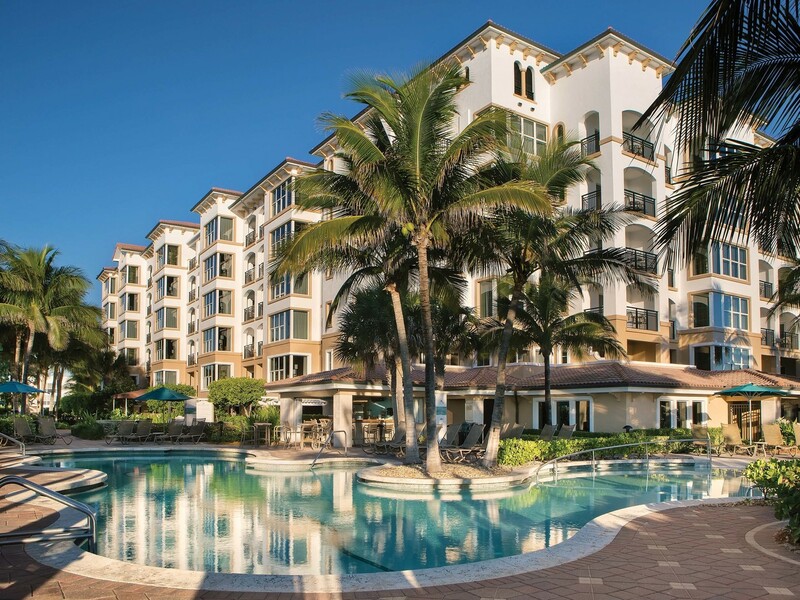 Marriott’s Ocean Pointe timeshares for sale provide a vacation your entire family can enjoy. The Lion Country Safari is an exciting attraction within driving distance from the resort. Enjoy America’s first drive though, cage-free zoo and a rare chance to encounter several endangered species. If travelling during your vacation is not on your agenda, Marriott’s Ocean Pointe also offers a variety of on-site amenities that are perfect for kids. To keep your kids entertained, the resort’s staff provides a children’s activity program for fun and exercise. The resort also provides a playground and children’s pool as family-friendly diversions. With so much available to see and do outside, you may wonder what a Marriott’s Ocean Pointe timeshare resale offers in your room. If you are looking for a vacation for your friends as well as your family, Marriott’s Ocean Pointe offers luxurious accommodations for larger groups. Spacious two and three bedroom villas are both available with two and three bathrooms respectively. King-sized beds in the master bedroom are standard, and in-room safes are available at no extra charge. Additionally, master bathrooms feature a whirlpool spa, which is the perfect way to relax at the end of your day. The villas at are equipped with a full kitchen including a refrigerator, range oven and microwave. As an added luxury, the kitchen is stocked with cookware, dishes, and silverware. Your villa at Marriott’s Ocean Pointe allows comfortable dining accommodations for up to 10 people. You don’t have to worry about missing the scenery while you enjoy your villa because stunning Oceanside and Oceanfront views await you in every room. Imagine enjoying the last few minutes of daylight at Marriott’s Ocean Pointe while you listen to the sound of the ocean from one of your two private balconies. The atmosphere of your villa at is so inviting, you may end up spending more time in your room than you planned on. For many, taking advantage of a timeshare resale deal at Marriott’s Ocean Pointe provides the perfect chance to escape the everyday world and relax. You will find the perfect balance of isolation and modern conveniences. A wide range of services are always available to you. In-room newspaper delivery and toll-free phone calls compliment your stay in your Marriott’s Ocean Pointe timeshare. On-site laundry services and safe deposit boxes at the front desk are also provided. There is no need to worry about forgetting to bring necessities. Visit the Marketplace on site at Marriott’s Ocean Pointe for snacks, treats, and spirits. Marriott’s Ocean Pointe also provides a concierge desk and foreign exchange service during your stay. If you think you’ve experienced everything that Marriott’s Ocean Pointe has to offer, you’ll realize that you have only just begun. Take advantage of the beach with nearby snorkeling and scuba diving. Marriott’s Ocean Pointe is also located near a scenic biking trail which allows a perfect chance to enjoy the environment around you. If it’s more adventure you’re after, you’ll find jet-skiing on the fantastic waters of Palm Beach just two miles away. The Marriott’s Ocean Pointe is also a paradise for golfers, with three 18-hole courses in the surrounding area. Sometimes the best way to appreciate something is to take a step back, and this timeshare resort is no exception. With a Palm Beach Princess Cruise, you can enjoy magnificent views of the coastline surrounding Marriott’s Ocean Pointe. Aboard the ship, your vacation can be complemented by dining, entertainment and gaming thanks to the casino on-board. Of course, how you spend your vacation at Marriott’s Ocean Pointe is entirely up to you. With such an abundance of activities and pleasures around you, this place becomes the perfect example of a vacation you won’t want to end. As an owner, you can leave with peace of mind, because you know that you will be returning again soon for another chance to experience all this luxurious resort has to offer. Experience a truly unforgettable vacation. Buy a Marriott’s Ocean Pointe timeshare resale as soon as you can, you will be glad that you did. People all over the world are enjoying the advantages of fractional ownership with Marriott Vacation Club. Search our Marriott’s Ocean Point timeshares for sale and feel free to contact Premier Timeshare Resale’s experienced staff for any questions you may need answered. There is never any pressure and our agents will get you the best priced Ocean Pointe Resale available. If the time has come to sell your Marriott’s Ocean Pointe timeshare contact one of our licensed agents today and remember there are no upfront fees!